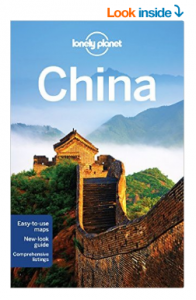 This is an update of our 32 tips for solo travel to China that was originally published in 2013. It has been extensively revised and expanded. I hope these tips help you have a fabulous trip to China. Doesn’t sound too flattering does it? But learning this does put one in one’s place. We are the outsiders. We are the guests. And we should learn how to behave. Hopefully the tips below, which were gathered with the help of my fellow travelers, will help you navigate and negotiate China with grace as well as greater ease. 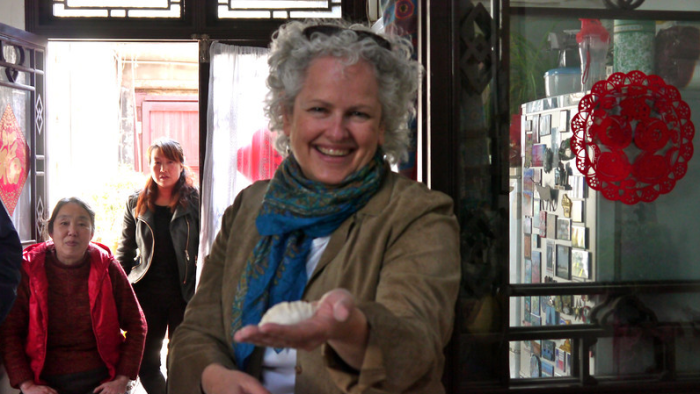 I say my fellow travelers because I was in China for three weeks as the guest of Overseas Adventure Travel (OAT). And though we had the benefit of an expert resident in each city and a local trip leader, we still noticed many things ourselves about traveling China that would be helpful to know before arriving. So, at one dinner, I got everyone brainstorming for this post. Here are the results plus a little research from me. Yes, prepare for all weather possibilities when you pack. 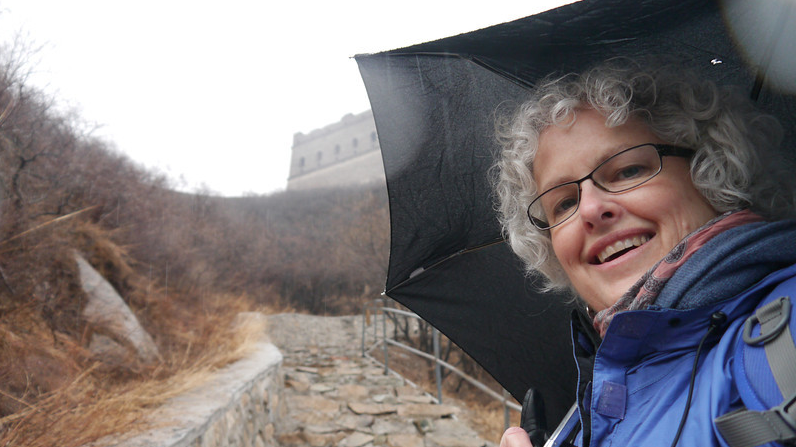 We climbed the Great Wall of China in the rain. You need a visa. Visas are a little complicated for China. If you’re transiting through a Chinese airport you Do NOT need a visa. If you’re transiting through some ports of entry in China to a third country within 72 or 144 hours and if you are a national of certain countries, you can apply for a visa exemption. It takes four days but you can pay more for express or rush service. It costs $100 for Canadians and $180 for Americans. Here are the supporting documents you’ll need. Your itinerary including air ticket booking record (round trip) and proof of hotel reservations, etc. Use Booking.com for your hotel reservations. Because you can cancel almost all bookings, you can show reservations and still be flexible with your itinerary. Alternatively, you can use an invitation letter issued by a relevant entity or individual in China. Read the visa application instructions for your own country carefully and give yourself lots of time to get it. You may need a multi-entry visa. If you’re going to Hong Kong mid-trip, be aware that you will either need a multi-entry visa for China or a new visa to go back into Mainland China. The former requires that you to show how you will go back to China and this can be complicated if you are planning to take the train – see below. If you stay in Hong Kong for at least four days you should be able to get a second visa while in Hong Kong. Canadians, Americans, Brits and Australians do not need a visa to enter Hong Kong. Pack light and with lots of layers. When I went (in April) the weather was warm in the day, cold at night. We had some rain. Your clothes need to cover many conditions. Take yuans with you. While the official name of Chinese currency is Renminbi, abbreviated to RMB, it is commonly referred to as the yuan. While credit cards are accepted some places, prepare yourself for a cash economy. Buyer beware. Shopping in China can be quite exciting but beware that if you buy knockoffs, for which they are famous, they could be confiscated at the airport. Read Shopping in Hong Kong: the opulent, the questionable and the affordable. If you’re not on a tour, take a guide book. This is one country that would be very difficult to navigate without one. 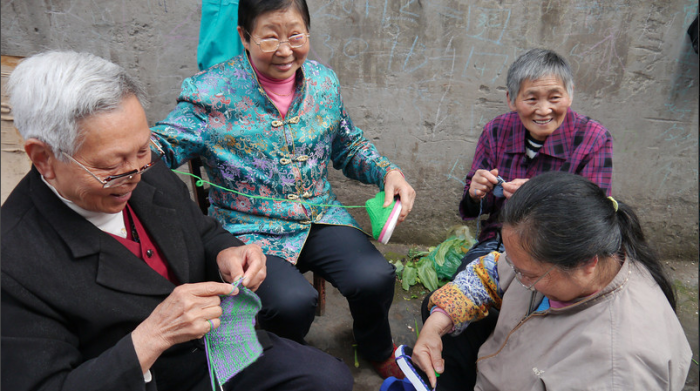 Knitting circle in the market in Fengdu. Drink bottled water. As is the case for many countries, this is the most important tip. Drink bottled water. Make sure that the cap cracks as you open it so that you know that it is the original, clean water in the bottle. An ATM is your best bet for getting cash. Not all banks accept foreign debit cards. Look for an HSBC to bank in person or check that the symbols that are on your debit card are also on the ATM. Learn a few words with these very phonetic spellings: Knee-how (hello for any time of day); Shay Shay (thank you); Gum Bye (cheers); Dui Bootse (sorry); How (yes/okay); Boo (no). You’re not going to get the tones right but with these basic words coming out of an obviously non-Chinese mouth, everyone seems to understand. Carry toilet paper with you at all times. It’s not always available in the toilets. Used toilet paper goes in the basket, not the toilet. Most toilets outside your hotel are squat toilets. If you’re not familiar with them, read up on how to use them before you go. There is only one time zone in China. Even though it’s a huge country. the time is always the same and your difference in hours to home is always the same. Crossing the street can be hazardous. Follow the lights if necessary but you’re actually much safer in the center of a crowd when crossing the street. Tipping is not expected. 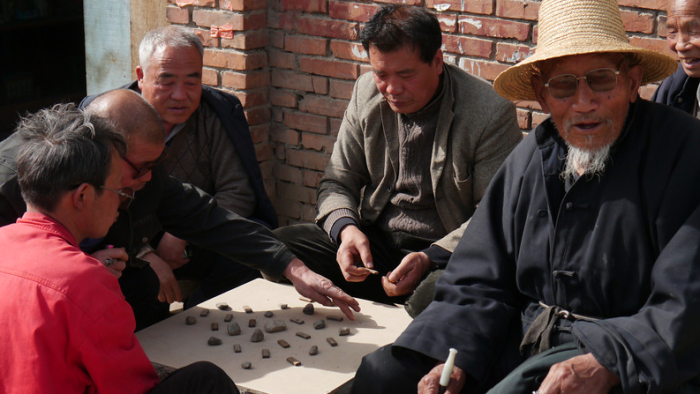 Tipping is not common in China however tour guides and drivers make their living from tips. $3 – $4 American dollars for a full day tour is fair. In high-end restaurants and hotels catering to westerners, tipping is expected. Haggling is expected. Don’t try this in chain stores or high-end boutiques but elsewhere haggling over the price of something is common. Wear footwear with really good traction. China uses a lot of polished granite outdoors and I slipped a few times. Oddly, when I got to Hong Kong, what looked like the same granite was not slippery. 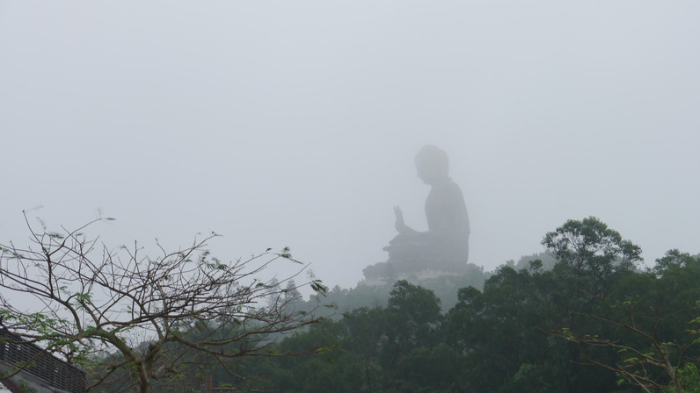 Despite the fog, the Big Buddha of Hong Kong was still impressive. Beijing and everywhere. Find the public parks. The Chinese have an amazing sense of community and their parks are full with people participating in shared activities from drawing to calligraphy to badminton and hacky sack. I particularly enjoyed the mornings when people were doing tai-chi. Xian is famous for the Terracotta soldiers. Unless you enjoy watching cheesy films, skip the movie-in-the-round. It’s terrible and a ploy to get you into the gift shop. To take really good pictures, make sure that you have a camera that’s decent in low light and has a good zoom. Chendu is known for the Pandas. Seeing the pandas is a beautiful experience but don’t miss the People’s Park. It’s wild. Activity is everywhere. From amateur acts on stage to matchmaking services to a massive tea house… you could spend hours there. Lhasa. Here’s a wonderful book about Lhasa, Trespassers on the Roof of the World: The Secret Exploration of Tibet. Lhasa is a challenging city from a political and cultural perspective but also due to the altitude. If possible, take the train to Lhasa and give yourself a couple of days to adjust before climbing the Potala Palace. Read Lhasa, Tibet: see for yourself..
Hong Kong It is possible to get out of the bustle of Hong Kong and enjoy nature. There is a 10K hiking trail to the Big Buddha that I have not yet done. Read Meetup.com Got me Hiking in Hong Kong: And it was #$@&%*! hard! Getting out of the cities into a village where we stayed at a guest house showed us the contrasts of China. Hotels. All the major chains have hotels in China’s major cities, but why stay at a western hotel? The hotels selected by Overseas Adventure Travel were all Chinese owned and gave a more local flavor. Guest Houses. Guest houses are a wonderful opportunity to get closer to the local culture. We stayed one night in a guest house in a village outside of Xian. OAT arranged for us to eat our evening meal there and help with the cooking which was a bonus for me as I learned how simple the basic dishes are. Also, our host took us to the local park in the evening where the whole village gets together for line dancing. It was a great time! Hostels. I met a number of solo travelers traveling independently in China. They were staying at Hostels and (with one exception in Chendu where the hostel was under a massive renovation) had good things say. You can check out hotels, starting in Beijing, here. The food was wonderful. 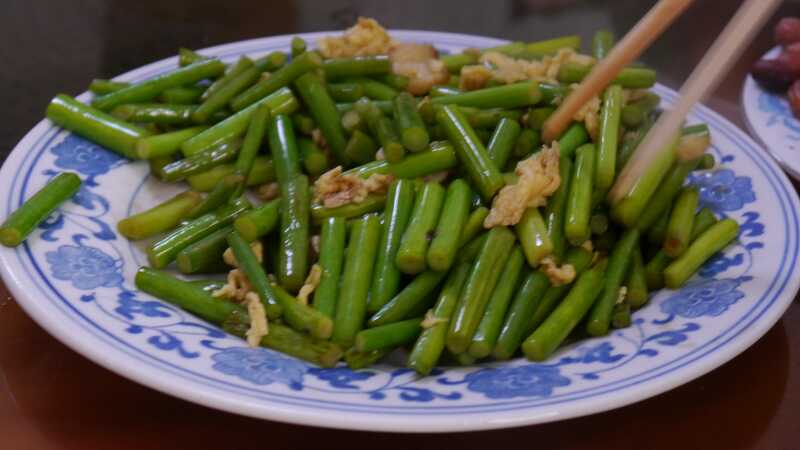 These are stir-fried garlic stems. Such a delicate, delicious garlic flavor. Drink bottled water. It was our first tip but it bears repeating. Pharmacies have western and eastern medicine. They can often fill prescriptions as well. Carry your travel insurance information. I travel with World Nomads insurance. One of the benefits of World Nomads is that should you decide to extend your trip (or you forgot to buy travel insurance before leaving) you can buy it on the road. Protect yourself from smog. Many Chinese cities have serious smog problems. A mask is a good idea but you may want to avoid too much exertion on particularly bad days. Carry hand sanitizer. Just as there is often no toilet paper in public restrooms, there is often no soap and water as well. If you need medical attention, make sure that you have a translator with you. Your hotel will likely help you find someone. Read I was a Guest of the Chinese Healthcare System. The subways are crowded but very efficient and surprisingly easy to navigate. The infrastructure of subways, roads, rails and flights in China is excellent. Subways. 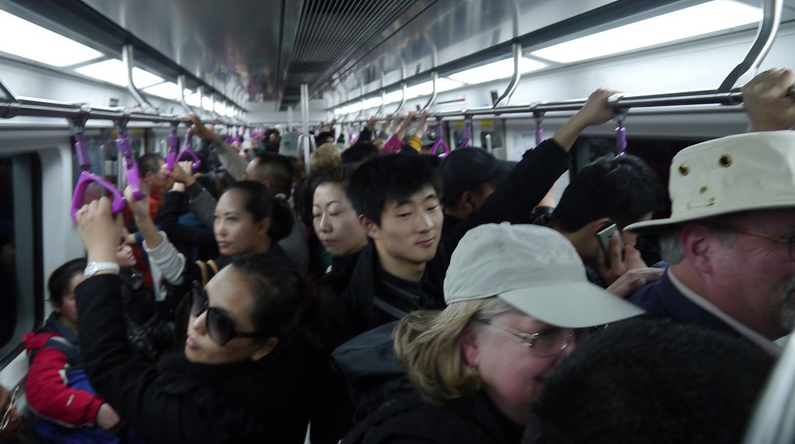 The subways in Beijing, Shanghai and other large cities are extremely busy but also efficient and inexpensive. During rush hour, there are people whose job is to push people on the subway. Don’t be alarmed. This is normal though you may want to avoid the busiest of hours. Taxis. I took taxis in Xian and Hong Kong and both were quite inexpensive. In Xian (and the rest of mainland China), tipping is not necessary. In Hong Kong, tipping is. In mainland China, have the name of your destination written in Chinese for you as your driver may not speak English. You need your passport to enter the train station. The toilets are mostly squat toilets however in first class you may find a western toilet at one end of the car and a squat toilet at the other end. Left luggage rooms are available at large railways stations making it possible to take an overnight train into a city for a day and leave that evening. Flights. Because China is such a large country, you may want to consider flights between destinations. The cost of domestic airfare is reasonable by North American standards. If you go to China with a tour company, I suggest that you go with a small group. OAT takes a maximum of 16 people per trip which means that you can go into people’s kitchens and learn things like how to make dumplings. It was a lovely experience. If you travel to China independently, these tips should be really valuable to you. If you go with a group, I hope they help you get the most out of your tour. What an experience! What a fabulous time! 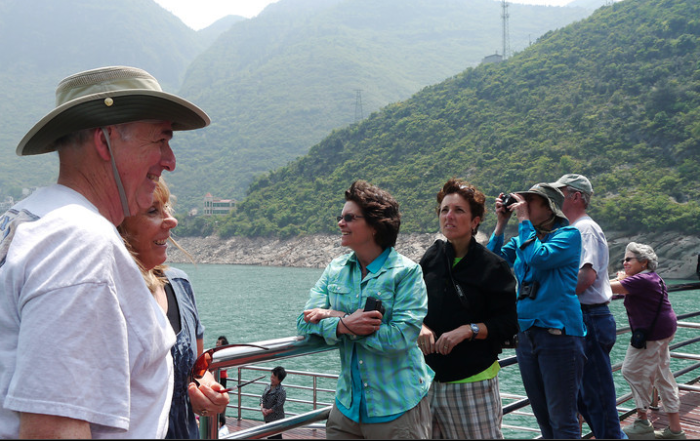 My thanks to Overseas Adventure Travel for making my trip to China possible.